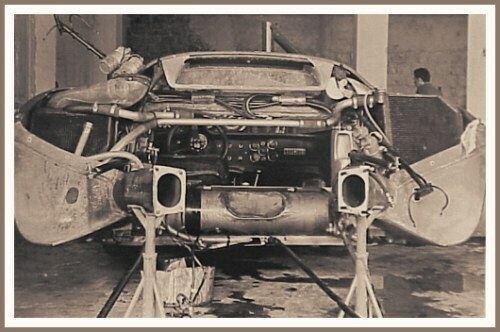 A truly great image of one of the Tipo 33's during preparation for the 1968 Targa Florio. "Alfa Romeo brought four prototypes to the Targa Florio and achieved a good result with second and third overall. With a dismantled rear suspension, gearbox and engine we can see right through to the cockpit as one of the cars is prepared for the race."